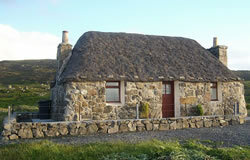 Evat holiday cottage South Uist is an original thatched cottage at South Lochboisdale in the Outer Hebrides. The cottage has been restored over the last year creating a comfortable cosy holiday cottage whilst still retaining many of the original features. With crisp fresh air and beautiful scenery on your doorstep this cottage is a wonderful location for a relaxing, stress free holiday in a charming part of the country. With shops, restaurants & bars just 4 miles away, you can escape in the quiet and peaceful scenery although only a short drive from amenities. Surrounding the cottage are amazing views and perfect locations for brilliant walks. Within a short driving distance you can experience the exquisite, picturesque scenes of local beaches and neighbouring island, Eriskay. The Western Isles are an idyllic destination for a peaceful tranquil holiday ideal for walking, fishing, and bird watching - golden eagles, otters, seals and dolphins are often seen. Only four miles from Evat cottage are deserted white sandy beaches stretching for miles. Price includes bed linen and towels and electricity. Pets are allowed. Small garden & private parking. The ideal setting for a serene holiday you'll always remember! Evat Cottage is strictly no smoking.